Wembley’s favourite foursome, JuiceBox have just released their second single, “The Golden Age of Television.” This track shows rapid growth from the alt-indie band, both in lyricism and musical style, taking on a heavier approach than can be heard in their previous release ‘Perfume’. Although there has been a wait for fans between the first single and second, it is clear that the boys have taken this time to work on their musicianship and take their sound in a new direction, as well as adding a new guitarist to the band to help create a more dynamic sound, both recorded and live. ‘The Golden Age of Television’ is a raw and even angry look into how TV and social media set unrealistic and false standards, depicting the ‘perfect life’ or ‘perfect person’ and how this affects the viewer. In particular the line, “little girls with photographs, of how they desire to look at last, but you can’t see the child anywhere,” stands out. In the past few years, there has been a trend in young girls doing all they can to look older or to live up to the beauty standards of the stars they admire the most, whereas the reality is these stars will have had cosmetic surgery to achieve their look. 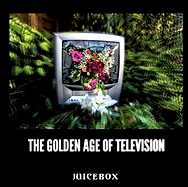 Heavy guitars and a catchy hook mixed with relevant and meaningful lyrics, ‘The Golden Age of Television’ shows huge progression for JuiceBox and is an exciting look into where the band are taking their sound.